Tag line: "A story of unnatural love...and unnatural death"
My good friend and fellow podcaster Jason Pyles (aka Jay of the Dead on Horror Movie Podcast) has been singing the praises of 1976’s Alice, Sweet Alice for years. Yet, despite his often-passionate recommendations, this is the first time I’ve ever seen the movie. There’s no good reason why, I suppose; I just hadn’t gotten around to watching it. Set in the early 1960s, Alice, Sweet Alice takes us to the small town of Patterson, New Jersey, where what should have been a peaceful First Communion ceremony at the local church instead becomes the scene of a horrible murder. It seems that a masked killer has taken a special interest in the Spages family: mother Catherine (Linda Miller) and daughters Alice (Paula Sheppard) and Karen (a very young Brooke Shields), and many in this close-knit community, including Catherine’s sister Annie (Jane Lowry) and the entire police force, believe the murderer is none other than Alice Spages! Try as they might, neither Catherine nor her ex-husband Dominick (Miles McMaster) can convince the authorities that their daughter is innocent. Even Father Tom (Rudolph Willrich), a catholic priest who’s taken the family under his wing, has his suspicions that Alice is deeply disturbed (due mostly to her erratic behavior in school), and fully capable of committing such atrocities. But is Alice truly the guilty party, or is the killer still on the loose? Now, that’s far from the most detailed synopsis ever written for Alice, Sweet Alice, but the reason it’s so basic is that I don’t want to spoil a single second of this film for you. What happens at the church during the First Communion service shocked the hell out of me, and there are other moments throughout that had a similar effect. Trust me when I tell you, this is not a movie you want to know a lot about before sitting down to watch it. So, what can I talk about? 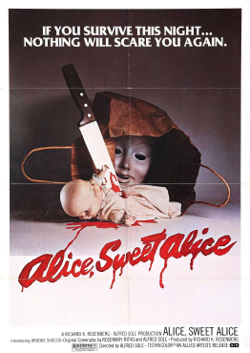 Well, I really liked the gritty look and feel of Alice, Sweet Alice, which gave it a ‘70s exploitation vibe; and while the kill scenes aren’t the goriest you’ll ever see, they’re certainly brutal, and occasionally happen so quickly that they catch you off-guard. In addition, the performances across the board are strong, especially that of Paula Sheppard as Alice. From the start, it’s obvious that Alice is a very peculiar girl. She has a tempestuous relationship with the family’s obese landlord (Alphonso DeNoble), who she insults every chance she gets (though not without reason, as we learn later on); and is jealous of her sister Karen, who appears to be their mother’s favorite (a scene with the two young siblings in an abandoned warehouse is one of many destined to stick with you). There are even some uncomfortable moments when Alice explores her sexuality. Whether she’s a killer or not, Alice definitely has deep-seated issues, and Miss Sheppard (in her screen debut) does a fine job with what I can only imagine was a difficult role to play. One last point: Alice, Sweet Alice features a major twist with regards to the murders that, had it come at the end of the film, might have sunk it. But because there’s still plenty of movie to go (about a half hour or so), the filmmakers have time to explain this surprising turn of events, and while I’m not sure I buy it 100%, at least I understand it. If you haven’t seen Alice, Sweet Alice, take my advice: don’t read anything about it (other than this, of course), and don’t watch the trailer. Go into the film completely cold. You’ll be glad you did. And be sure to thank Jason for championing this movie. I owe you one, sir.